David Beckham is coming to MLS. All is official. "I've played now for two of the biggest clubs in the world. 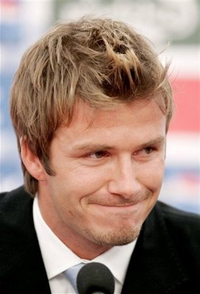 I've played at the highest level for 15 years, and now I think I need another challenge," Beckham said. It looks like MLS's Beckham rule will be used to get the man after which it has been nicknamed. No word is official, but with Real Madrid giving Beckham the boot yesterday, it does look like this is not just another rumor. By the way, the talk says he will be paid $9 million a season, the BBC is reporting the deal to be worth £128m over five years, or $250m. That's $50 million a year. To put the in perspective, the total guaranteed salaries of all players in the MLS for the 2006 season was about $23 million. Look for MLS to go into total Beckham mood fast as every club will press the sale of tickets to matches against the Galaxy. So, will Becks get the captain's armband or will Landon Donovan keep his top spot? Update: Beckham will move to LA once his contract with Real Madrid ends on June 30 with his MLS debut likely to happen in early August. Future home of St. Louis MLS team? Real Salt Lake Stadium Deal Dead again?